Your wedding color story is where planning starts. You can be inspired by the yellow in a sunflower or the blue from the Tiffany box your beloved presented you when they proposed. However you are inspired, it’s not always easy to get every detail to fall in line. The folks over at Minted.com are here to help, at least with your stationery needs! Their in house team of designers will go that extra step to customize their huge selection of wedding stationery to match the lavender in your bridesmaid’s dresses or the pink in your signature cocktail. 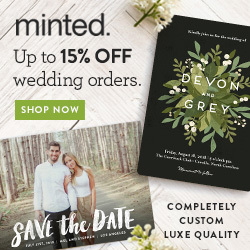 Customization fees like these often add up, but Minted is now offering free color customizations for this wedding season.